Holidays are a busy, joyful time to celebrate with the ones you love. A time to share your traditions and fill your heart with what the holidays mean. I have a large list of holiday chores; partying, baking, shopping and hosting. It can be a crazy time! One thing I have learned thru the years is always to take the time and seek out what really is important and celebrate that . No matter how big or small your holiday celebration is, I hope your festivities are filled with what makes you happy! In a medium sauce pan mix mixed berry pie filling, 1 small sprig rosemary, ginger and five spice. Cook sauce on medium heat until heated through, stirring often. Remove rosemary. On a cookie sheet, place chicken wings, pour oil over wings and season with salt and pepper. Mix to coat all wings. 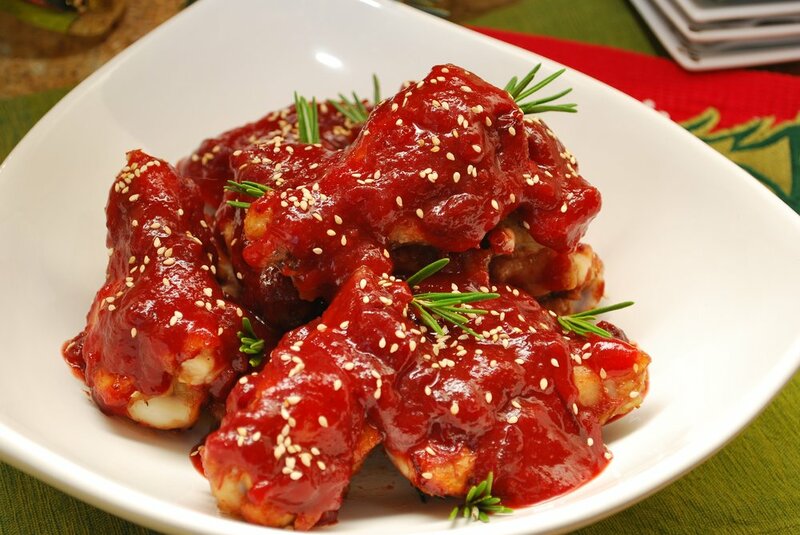 Take 1 cup of prepared sauce, brush ½ of the cup on the top of wings. Cook for 30 minutes, flip wings and brush the other side with the other half cup of sauce, place under broiler to caramelize sauce to wings, about 4 minutes. Place wings into a serving bowl, pour remaining sauce on top, sprinkle with sesame seeds and garnish with the remaining rosemary. Serve and enjoy. great dish to bring to your Holiday Party! Add butter and sugar to mixing bowl and blend on low speed with whisk attachment until combined. Slowly increase speed to medium and beat for another 3 minutes. Add vanilla and cream, continue to mix on medium speed for 1 additional minute. Add more cream if needed for spreading consistency. Dry cherries on a paper towel. Dip each cherry into melted chocolate to only coat half of the cherry and set on a piece of parchment paper to let chocolate set. Once cookies are cooled, pipe a large dollop of butter cream onto top of each cookie. Top each with a prepared cherry. With electric mixer and paddle attachment, cream butter and sugars on low speed until incorporated. Then continue to blend on medium high until light and fluffy. Add vanilla and eggs one at a time. Add cocoa and gently mix on low speed until well blended. Increase speed until fully mixed. Combine flour, baking powder, baking soda and salt. Add mixture to chocolate batter and mix at low speed until combined. Fold in chocolate chips and dried cherries. Chill dough and cookie sheet in freezer for 1 hour. Drop golf ball size dough onto parchment lined baking sheet. Bake cookies for 12-15 minutes, or until edges are slightly browned. Remove from oven and let cool for a minute or two on cookie sheet. Transfer to wire rack to cool completely.